In October 2014, Pope Francis told a group of evangelical Protestant leaders visiting him at the Vatican, "We each have in our churches excellent theologians. That's another way to walk together also. But we shouldn't wait for them to reach agreement!" 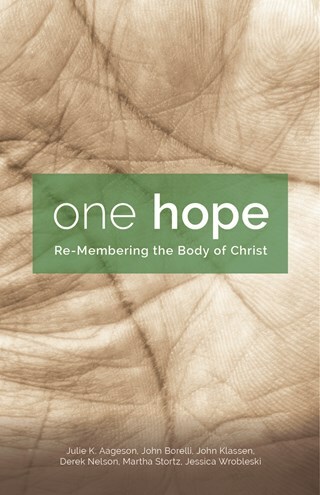 One Hope: Re-Membering the Body of Christ is a resource to help local Christian communities walk together, recognizing and nourishing unity at a grass-roots level as we mark the five hundredth anniversary of the Reformation. The essays in One Hope are the product of an intense collaborative process by six gifted scholars and pastoral leaders, three Lutheran and three Catholic. They explore experiences and activities that Catholics and Lutherans share and which connect to the living of their faith in embodied ways: breathing, eating, singing, forgiving, serving, and dying. One Hope will serve as a welcome resource for adult faith formation and parish discussion groups made up of Catholics, Lutherans, members of other denominations, or combinations thereof. Discussion questions conclude each chapter. Julie K. Aageson recently retired as coordinator of ELCA Resource Centers and director of the Eastern ND Synod Resource Center at Evangelical Lutheran Church in America. Aageson is a freelance writer and writes for two ELCA magazines. John Borelli is special assistant to the president for Interreligious Initiatives at Georgetown University. He previously served as associate director of the Secretariat for Ecumenical and Interreligious Affairs at the US Conference of Catholic Bishops and consultor to the Vatican's Pontifical Council for Interreligious Dialogue. He has participated in church-sponsored ecumenical and interreligious dialogues for over thirty-five years. He has published several collections and over 200 articles on ecumenical and interreligious relations. John Klassen, OSB, is in his fourteenth year of service as abbot of Saint John's Abbey in Collegeville, MN. He serves as cochair of Bridgefolk, a grassroots Mennonite-Catholic dialogue movement. Derek Nelson is associate professor of religion at Wabash College in Indiana and director of the Wabash Pastoral Leadership Program. He is the author of a new biography of the sixteenth-century theologian Martin Luther. Martha Stortz is the Bernhard M. Christensen Chair in Religion and Vocation at Augsburg College in Minneapolis, Minnesota. She is the author of Blessed to Follow: The Beatitudes As a Compass for Discipleship and other books. Jessica Wrobleski is assistant professor of theology and religious studies at Wheeling Jesuit University in West Virginia. She is the author of The Limits of Hospitality (Liturgical Press, 2012). This ecumenical resource for use at the grassroots level in Roman Catholic and Lutheran congregations is designed to assist those communities toward common recognition and even liturgical acknowledgment of the five hundredth anniversary of the Protestant Reformation that will occur in 2017. The opening vignettes in each chapter are themselves often moving and will clearly engage participants in conversation.